"I was reluctant to try the Bianco Smile Whitening Kit as I have quite sensitive teeth, but this product has proven to work extremely well and best of all, I have had minimal sensitivity at all after use. Here are my results after the full 14 days - my teeth literally look unrecognisable. People have never complimented me on having white teeth... they do now!". - James Tiliaveridis. 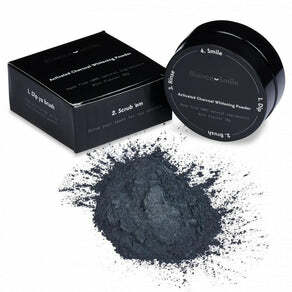 "I've been using the activated charcoal powder for around 2 weeks now - the results i've been seeing are amazing. My teeth instantly look whiter, getting rid of those tough stains that regular brushing struggles with - when I run my tongue over my teeth they also feel extremely smooth and clean too. The product tastes a lot better than some of the other charcoal powders i've tried too, with a nice mint taste."